Spicy fish curry /Meen Vatticha curry is a famous traditional curry in our place in Kerala.The literal meaning of the recipe means fish is reduced in gravy and the fish curry is a blend of spice and tanginess due to the addition of gambooge/kudampuli.The dish serves perfect with rice or kappa vevichathu.Toddy shops and thattukadas(street shops) serves the best recipe for this and it tastes awesome.We served it with kappa vevichathu and we love the perfect combo.Marriage caterers in our place make this curry the previous day and serve the next day for the feast as the fish absorbs the flavors best then.My grandmother used to prepare this dish and she says the curry stays good for days without refrigeration as there is no use of shallots,onion or coriander powder.They just boil it in the night in the clay pots/mannchatti,cover & leave aside.Those are the days when people had lesser exposure to technology & so diseases too,Today technology is so very advanced and so are diseases related to the use of these newer features in our life styles.Isn't it?? 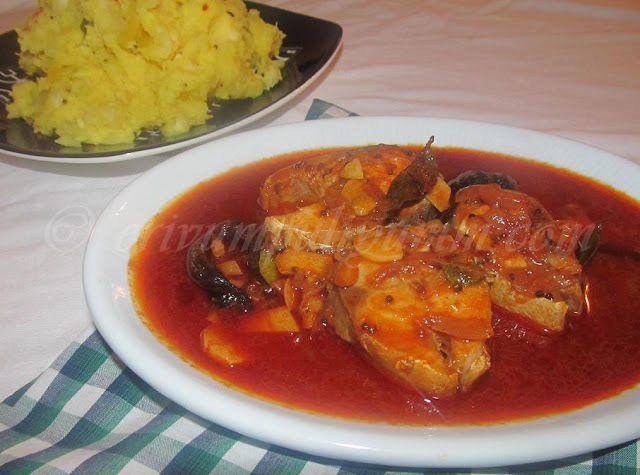 Stories apart,so try this spicy version of fish curry that has passed through generations.This fish can be prepared for any thick fleshed fish like mackerel,king fish,tuna,salmon.We tried it with mackerel,enjoy with some kappa vevichathu/ Cooked tapioca !! -Clean,wash and cut the fishes in smaller pieces as desired.Rub with salt and lemon juice if desired.Wash under running water 5-6 times until water is clear.Drain and keep aside. -Wash and soak the gambooge/kudampuli in 1/2 cup water. -Heat the coconut oil(1 tbsp)in a pan and splutter mustard seeds.Add the shredded garlic and sliced garlic.Add the shallots (if using) and saute till translucent. -Add the curry leaves and saute till raw smell of ginger & garlic disappears. 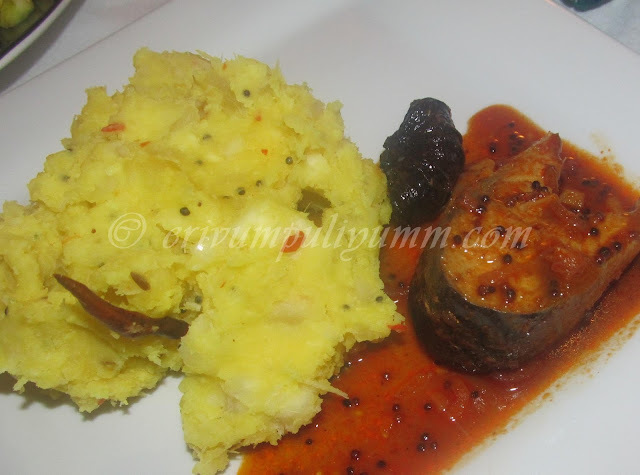 -Lower the flame,add the chilly powder,turmeric powder followed by uluva podi. -Add 1 cup of water and bring this to a boil.Add the salt and gambooge(kudam puli) with the water(1/2 cup).Let it boil again and then slide the fish pieces in it. -Boil it on medium high flame and then reduce flame to medium low.Let the fish cook and the gravy thickens,takes about 10 minutes covered.Uncover and cook for another 10 minutes. (Oil starts floating in the sides and top).Adjust salt if required. -Switch off flame and drizzle 1/2 tbsp of coconut oil on top with a sprig of curry leaves.Cover and leave for 10 -20 mins so that the flavors blend. 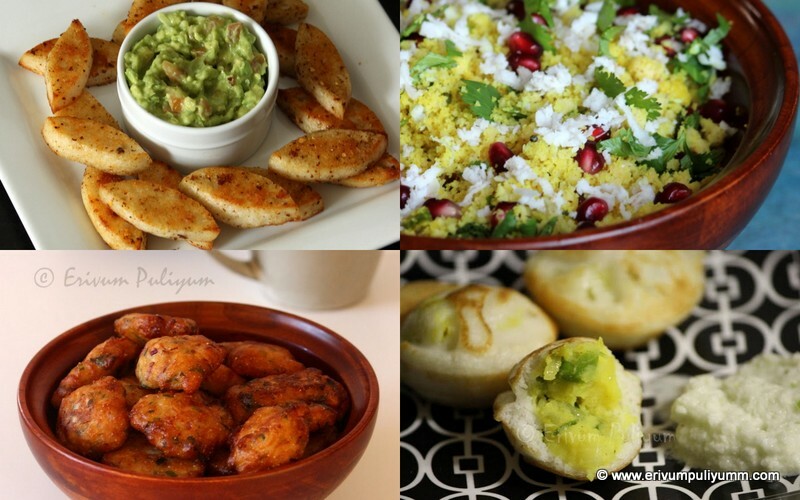 -Serve with kappa vevichathu /rice. * Shallots are not in the traditional recipe.I usually add shallots to add flavor but if you are storing for next day's use without refrigeration then itsbetter not to use it.If you are refrigerating,then no issues. 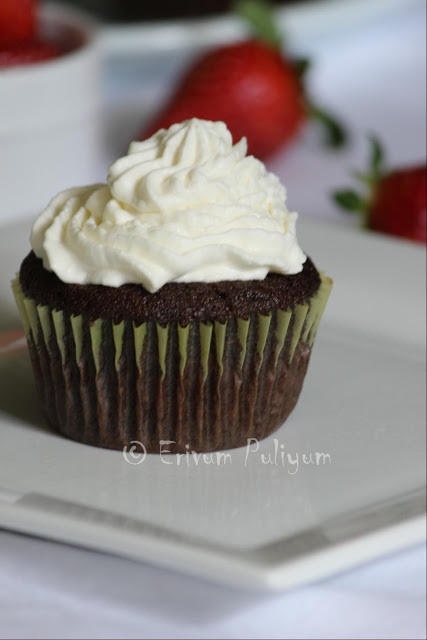 * Coconut oil at the end is added to retain the flavor and to reduce the spice level. * Kashmiri chilli powder is a must in this recipe as this is low in spices and can be used moderately.The chilly powder adds thickening to the gravy.If you use the other chilly powder then,don't use the specified amount,reduce accordingly. * Adding turmeric powder is also strictly optional. * If you wish a slightly thinner gravy then add 1/2 cup more water. This curry looks finger-licking good! Love the color of the curry. 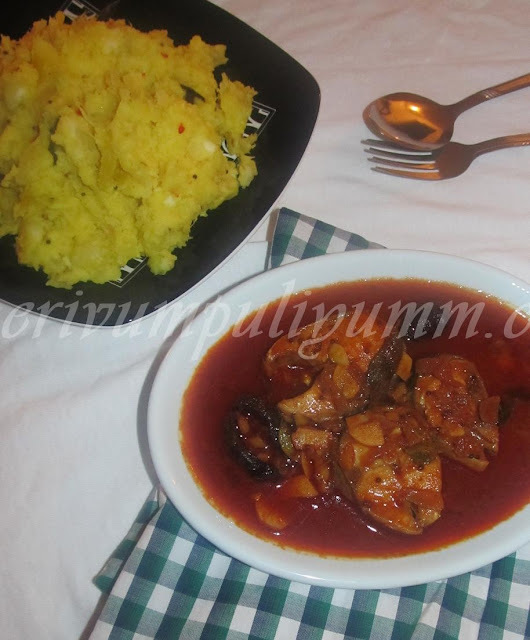 I love fish curry and kappa....Match made in heaven...! My H favorite gravy..Love this traditional dish..
like its bright color.. flavorful..
Congrats Julie, great looking blog! Fish curry looks awesome! 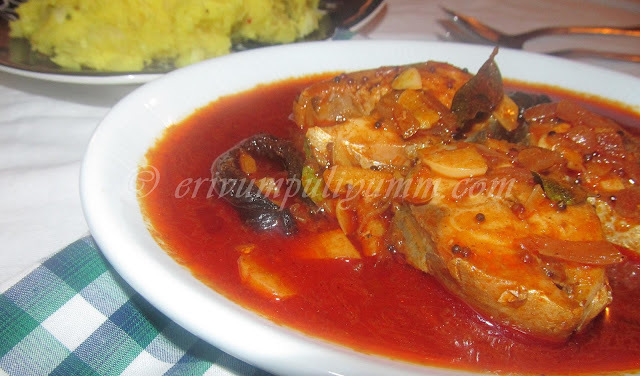 Fish curry looks so appetizing..love the gravy colour. I am drooling here, how i wish i could grab them from mt screen. Wow! The fish curry looks delicious! Very yummy! Love your new home! The curry looks delicious! Droolworthy fish curry Julie. May I come to your place, so irresistible fish platter. 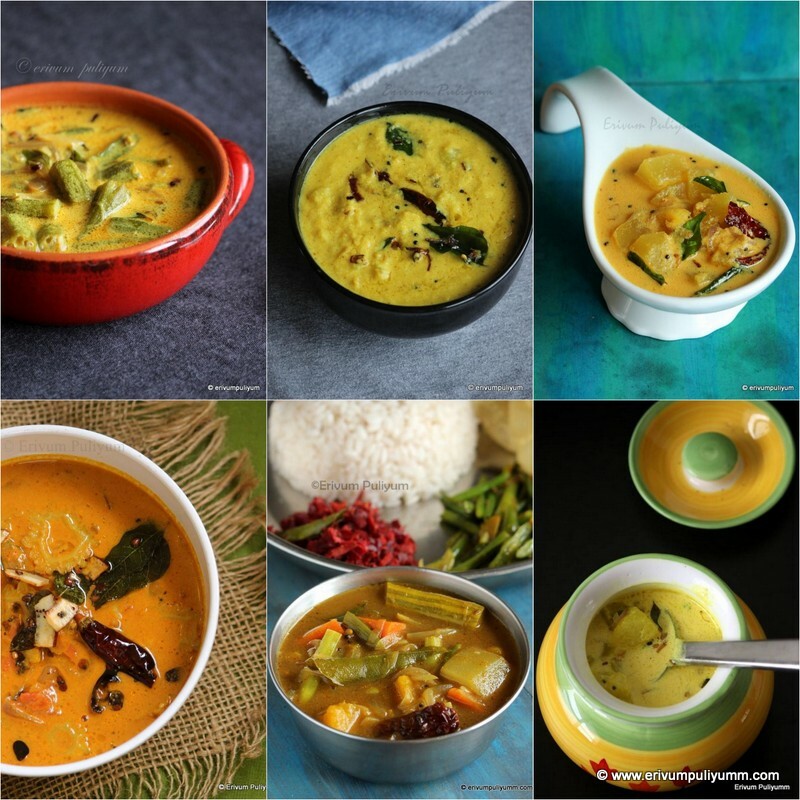 Colour itself tempts me a lot, super irresistible meen curry..
yumm kappa and meen curry..what more can a mallu ask for..feeling so hungry just looking at your pics. Regarding the kashmiri chilly powder,yes it is 3 tbsp.. the fish sauce is thickened with the chilly powder in it and so you need that amount. In case if you are really apprehensive about the outcome then add 2tbsp of kashmiri chilly powder and a tsp of coriander powder,that also works fine and the sauce gets thickened. But adding coriander powder doesn't preserve longer esp if you keep it outside at room temperature. Hope this helps.